In 2015, I conducted a survey of over 2000 readers with Hashimoto’s asking for the most helpful interventions in their health journeys. While only 38% of those that tried Low Dose Naltrexone reported feeling better, the ones that saw benefit had some spectacular results. 48% were able to reduce thyroid antibodies, 61% saw an improvement in mood, 66% were able to have more energy, and 40% saw a reduction in pain. I have personally seen this medication change people’s lives and wanted to share some more information on it, in case you have hit a plateau of your healing journey. 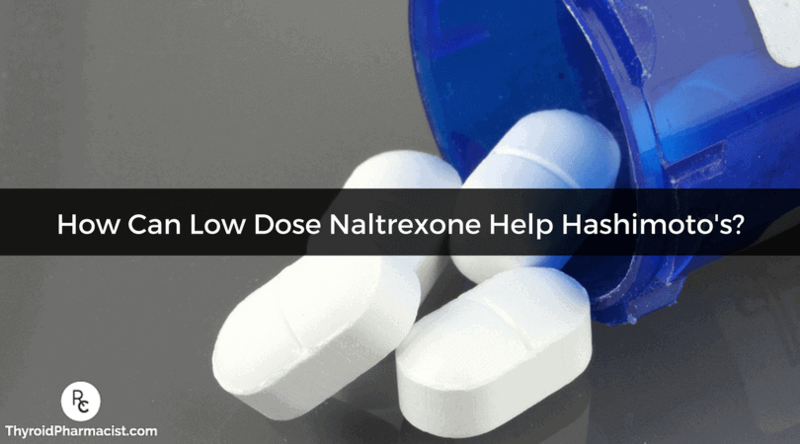 Naltrexone is an FDA-approved medication used for opioid withdrawal at a dose of 50 mg per day. However, low doses of this medication have been found to tweak the immune system and have shown promise in improving cases of autoimmune disease including Crohn’s, MS, and Hashimoto’s, as well as other immune system-related conditions such as cancer and HIV/AIDS. Doses of 1.5 – 4.5 mg per day are usually recommended and have been reported to enhance immune function through increasing our endogenous endorphin production, reducing inflammation, promoting DNA synthesis, and slowing down motility in the GI tract to facilitate healing. Low dose naltrexone (LDN) balances the immune system by increasing the amount of T-regulatory cytokines and modulating TGF-B, leading to a reduction of Th-17, the promoter of autoimmunity. This means that it turns off the cells that cause autoimmunity! This medication is available only as a prescription and can be compounded into lower doses by special professional compounding pharmacies. Luckily, even without insurance coverage, this medication is available in generic form and is very affordable, usually costing between $15-$40 per month. The websites dedicated to sharing research are Low Dose Naltrexone (LDN) and LDN Research Trust. They are full of testimonials about ulcers, tumors, and lesions disappearing within months of initiating LDN. The authors of the website even caution users with Hashimoto’s taking supplemental thyroid hormone to start low (1.5 mg per night) and to watch for emerging signs of hyperthyroidism that may result from rapid improvement of the condition. I decided to interview Dr. Mark Mandel, PharmD, compounding pharmacist, LDN expert and fellow Midwestern University Chicago College of Pharmacy Grad, on the effects of LDN in people with Hashimoto’s and autoimmunity. Dr. Mandel was kind enough to share his knowledge with me. IW: What types of people benefit from LDN? MM: We have seen amazing results with people with autoimmune conditions, cancers, and neuropathic pain. IW: How is LDN thought to work for autoimmune conditions? MM: The exact mechanism has not been determined, but the theory is that LDN increases endorphin activity two to three fold. Additionally, it may increase the numbers of endorphin receptors and/or the sensitivity of the receptors. The increased endorphin activity results in better modulation of the immune system. IW: How is LDN taken? LDN can be taken in the form of a compounded tablet, capsule, liquid, or transdermal formulation. We often find that the transdermal (skin) or sublingual formulations work best for those with liver issues. The transdermal formulation is recommended for children with autism. For people who are new to LDN or for those with swallowing issues (dysphagia), I will usually recommend starting with a liquid formulation. That allows us to figure out the correct dose for each person. IW: What are some of the more common adverse reactions that people have to LDN? MM: Sleep disturbances, nausea, and irritability are some of the issues that people report. For those that have nausea, we have found that using a sublingual dose seems to help. In cases of sleep disturbances, we recommend adjusting the dose to morning time instead. Liver toxicity has been reported with the full dose naltrexone but none that I have encountered with the low dose naltrexone. However, we always recommend liver function tests while taking this medication. IW: What types of benefits can be seen with LDN for thyroid disorders? MM: Once you have been titrated to the correct dose, you will start feeling better. This will usually be followed by an improvement in labs, such as improved markers in TSH, T4, T3, and TPO levels. The time to start feeling better will, of course, vary per person. Once you start to feel better, maintain the dose for 2 – 3 months, and follow-up with your physician to see if your laboratory markers have improved. I recently had a patient with hyperthyroidism who struggled with trying to get pregnant for many years and was finally able to get pregnant after starting LDN. IW: Speaking of pregnancy, is LDN considered to be safe during pregnancy? IW: Is LDN a life-long drug? MM: Not necessarily. We have experienced patients with chronic neuropathic pain who had used LDN for a limited time period and was able to stop it, and if you are a young person with Hashimoto’s, you can go into remission through modulating your immune system with LDN. The medication will help you move towards an appropriate immune status, and once the immune system is in balance again, you may be able to get off the LDN. IW: What advice do you have for those considering the use of LDN? MM: LDN should be used as part of an arsenal to help you overcome your autoimmune condition. Appropriate levels of vitamin D, full spectrum light exposure, and food sensitivities all play a role in autoimmunity and need to be considered as well. It’s also best to work with a compounding pharmacy that can help you titrate your dose correctly. Dr. Mark Mandel, PharmD has two pharmacies in the Chicagoland area. The pharmacies provide compounding services (including LDN and thyroid hormones), hormone balancing solutions, and a Mastectomy Boutique that can be found at the Roselle location. As those of you that have read my book will know, the immune system can be thrown off balance by a variety of factors. Some of those factors include food sensitivities, infections, or an imbalance in gut bacteria. Thus, I always recommend using LDN as a part of a whole person approach and not as a standalone therapy for best results and for increasing your chances of remission. I also want to stress that LDN is not a cure, but rather an immune modulator that can be used to prevent further damage to the thyroid while one is looking for their root cause or to rebalance the immune system when the root cause cannot be found. LDN is not a commonly prescribed medication, and it may not always be possible to convince your doctor to prescribe it. On my quest to try LDN, I talked to my local compounding pharmacist to figure out which doctors in my area were knowledgeable about prescribing LDN. LDN was one of the first interventions that I tried on my thyroid journey back in 2009. As a pharmacist, I was looking for the magic immune system pill, but I found that it made me somewhat irritable after a few nights of taking it, so I gave up on it and moved on to something else. Instead of working with a compounding pharmacist, I made the mistake of getting full strength naltrexone and compounding it myself. As I mentioned in Root Cause, I also used LDN before I started working on my diet. Had I worked with a knowledgeable professional, I would have learned that LDN works best when used alongside a leaky gut diet. Additionally, according to Shannon Garrett, RN- LDN may not work if someone has a candida overgrowth. In addition, for improved tolerability, titrating the dose is necessary. It took me over three years to get myself in remission. I hope that with the information I share in my book and on this blog, you will be able to get yourself into remission more quickly and efficiently. You can also download a free Thyroid Diet Guide, 10 Thyroid friendly recipes, and the Nutrient Depletions and Digestion chapter for free by going to www.thyroidpharmacist.com/gift. You will also receive occasional updates about new research, resources, giveaways, and helpful information. The Low Dose Naltrexone Homepage. Lowdosenaltrexoneorg. 2017. Available at: http://www.lowdosenaltrexone.org/. Accessed July 11, 2017. LDN Research Trust – Low Dose Naltrexone |. Ldnresearchtrustorg. 2017. Available at: http://www.ldnresearchtrust.org/. Accessed July 11, 2017. Wentz I, Nowosadzka M. Hashimoto’s Thyroiditis. 1st ed. Wentz LLC; 2013. I have Hashimoto’s and started using LDN approx. 2 months ago. At that time I was taking 2 grains of Armour thyroid and my TSH was suppressed my FT3 & FT4 near optimal but my antibodies were still 900. Within a week of dosing 1.5mg of LDN at bedtime I had to reduce my Armour dose to 15mg. After a couple of weeks the “sleep disturbances” associated with LDN became horrific nightmares so I started taking the 1.5mg dose mid morning. I can’t say that I “feel” any better nor have I lost any of the disgusting weight I gained with this disease and I do still suffer with brain fog. The high dose of Armour did not resolve any of these issues either, so I don’t know if there is any point to using the LDN. Is it better or worse than 2 grains of Armour? Dianna- Thank you so much for sharing! That is amazing!! You may also be interested in checking out the Root Cause Recipe Portal. It is full of autoimmune paleo and paleo recipes. You’re able to organize weekly shopping lists, meal planning, etc. Hope you check it out. I was wondering how you got the script for doing your compound ed medications? Did you need a medical script to get that done anotherwords. How would I go about getting that and what type of doctor would support this if you have been treated for hypothyroidism and your autoimmune antibodies are present. The pounds fall off because you are eating nothing. I did it, I’ve watched what people eat on Pakeo… Total depression from doing the paleo diet. I almost would rather be in pain then be as depressed as I was on Paleo. It’s inconsiderate to speak in such general terms about autoimmune disease. Glad you did the work you needed to for you. But I’ve done that and so much more and still have not gotten any relief from the fatigue muchless the weight I’ve gained. Sounds like you had it easier than most with Hashis and again good for you, but don’t pretend to have the answers for those of us who have been suffering for years and did all those things you mentioned hoping for a result that never came. I was told by several docs AND read online that Armour thyroid is not the best to use with Hashimotos….to use the artificial T4T3 compounds or synthroid etc…..something about the autoimmune nature and it attacking the natural thyroid….I tried Armour thyroid before being diagnosed with Hashimotos and got worse than on the T4T3 compound. I’ve been taking the LDN in the a.m. for a week now- no difference in anything yet. ESD- thank you so much for following this page. There are quite a few options for thyroid medications. In my experience, what works for one person may not work for another. If your doctor will not prescribe the medication you are looking for, ask your local pharmacist for doctors in your area who prescribe the medication you are looking to try. Have you read these articles? I have thyroid problems. I have been dealing with low thyroid problems for 2 years and maybe longer. But have been on medications for 2 yeas now. Armour 90mg (have taken stronger but gave me racing heart), levothyroxine 75mg. I am at a lost on what to do. I workout 4-5 days a week doing crossfit, Unable to lose weight ( which is very frustrating) I was/am a vegitarian (I am working on eatting more meat but slowly). My friend stated that she just started taking Naltrexone 2.5mg and she states that she has never felt better. I am so ready to feel better, not sleepy through the day, rest all night and get up and feel rested not still tired. I am not sure if you can even help me but if you can that would be great or even any advice. Cindy- There are quite a few options for thyroid medications. In my experience, what works for one person may not work for another. If your doctor will not prescribe the medication you are looking for, ask your local pharmacist for doctors in your area who prescribe the medication you are looking to try. Have you read these articles? My Doctor who practices Integrative/function medicine told me that about 30% of Hashi’s patient respond negatively to Armour and those like it because the immune system identifies it as foreign tissue (that of a pig) and so the antibodies go up and the disease worsens. He finds it safer and just as effective to find the correct balance of T4 & T3 and uses synthroid and cytomel. He also prescribes bio identical hormones and a gluten free diet, along with femented food such as Kefir. That being said, so far, I am not improving and so he added bio identical cortisol since my cortisol levels are low during the day and high at night. He wanted to do this before adjusting my T4/T3 combo which is currently .125 synthroid/.5 Cytomel. No improvement with the cortisol. My hair is still rapidly thinning and my shoulders HURT. Any suggestions on dosing I can relay to him? Cary- thank you so much for following this page. I wanted to try LDN, but my doctor was discouraging about it, one of his rationales against it was the nightmares. Still, individual response will likely vary. I still want to try LDN, and have been considering a switch to another doctor anyway for multiple reasons. Paula- thank you so much for following this page. Regarding LDN: I started it in March, as I have Hashimotos. My doctor told me when we started LDN that we needed to monitor my bloodwork closely, as if it works for me, we may have to decrease my thyroid dosage. Well, due to gut issues, around the same time I started LDN, I changed my diet to a much healthier one. Now it’s June, and I am finding that I have HYPER thyroid symptoms with nervousness, anxiety, insomnia, etc., can’t stand to be outside in the summer heat, etc. I am soon to have bloodwork, but it appears to me that the LDN must be working along with the diet, and possibly overmedicating me. When I first started LDN, I had very vivid dreams for probably the first week or so. That has decreased, though I am titrated up to 4.5 mg now. In fact, I seem to enjoy my dreams now, because I can remember them better upon waking. Every so often a bad one sneaks in, but that happens without LDN, too. I am excited to get the bloodwork done, but also want the HYPER symptoms to go away. I do believe from the way I feel that the LDN is working for me. Joan – thank you so much for sharing your journey! I am happy to hear you are getting your labs done to see if your markers have improved. LDN should be used as part of an arsenal to help you overcome your autoimmune condition. LDN was one of the first interventions that I tried on my thyroid journey back in 2009. As a pharmacist, I was looking for the magic immune system pill, but I found that it made me somewhat irritable after a few nights of taking it, so I gave up on it and moved on to something else. Instead of working with a compounding pharmacist, I made the mistake of getting full strength naltrexone and compounding it myself. I also used LDN before I started working on my diet. Had I worked with a knowledgeable professional, I would have learned that LDN works best when used alongside a leaky gut diet. Additionally, according to Shannon Garrett, RN- LDN may not work if someone has a candida overgrowth. In addition, for improved tolerability, titrating the dose is necessary. It took me over three years to get myself in remission. I hope that with the information I share in my book and on this blog, you will be able to get yourself into remission more quickly and efficiently. Well I am looking forward to giving it a shot. I am starting at 1.5. I have been a on a gluten free diet since October, I have lost a few pounds but not much. I recently went on 1 grain of Armour thyroid the last few weeks, and I know I may have to bring down the armour thyroid if I start going hyper. My antibodies went from 630 in October to 844 in Feb. As you can see I have got to try something different. Thomas- Did you know that reactive foods trigger an inflammatory response in the GI tract, leading to malabsorption of nutrients (gluten sensitivity in particular has been implicated in causing a Selenium deficiency, a well known risk factor for Hashimoto’s), and can also produce intestinal permeability whenever they are eaten? Dr. Wentz! THis is like coming home, all of your experiences are what myself and daughter have encountered for more than ten years, and thousands of money later.I knew you were the real deal for me when yo mentioned that your hair falls out in the shower! Whether or not I was on pharm meds! Everyone blew it off. Thank you for your research and sharing! Kasey- Thank you so much for your support!! Thyroid tissue can regenerate, but the rate at which it does is not always predictable. Thus, some are able to stop the autoimmune attack on their thyroid and regain normal thyroid function. Others can reduce the dose of medications, and others will need to stay on the medications indefinitely. I’m currently working on some protocols to help with tissue regeneration. HI, That would be awesome to regenerate the thyroid and not need thyroid medicine. My acupuncturist lasered my thyroid, but all it did was make me hoarse/swell. I have tried to do everything I need to be well. A Zyto scan said my thyroid was at 60%, but mitochondria were hurt by heavy metals/chemicals/antibiotics so I need a thyroid dose to compensate for hurt mitochondria. My pituitary is also not making TSH. Gluten may hurt all glands…thyroid/pituitary/liver/adrenals/pancreas and more. All cells are affected. I came to this blog entry while in the midst of another “Google Death-Spiral” session, familiar to all sufferers of conventional medical misdiagnosis/mistreatment in search of answers. I appreciate your efforts to inform and advocate for those suffering from Hashimoto’s via alternative approaches. I only wanted to inquire about an inconsistency between the information in the intro of this posting about the therapeutic effects of LDN, and what I’ve read concerning those same effects on other sites. It is this effect on gut motility that I’m confused about, since other sites list the LDN as an effective prokinetic agent in treatment of SIBO or chronic constipation, effectively increasing motility. Can you shed any light on this seeming disconnect, or am I reading this wrong? Richard- There are quite a few options for thyroid medications. In my experience, what works for one person may not work for another. If your doctor will not prescribe the medication you are looking for, ask your local pharmacist for doctors in your area who prescribe the medication you are looking to try. Have you read these articles? That is not an answer to what Richard ask you. You seem to give this standard, cookie-cutter response to many very different questions. There are many other auto-immune conditions other than Hashimoto’s, such as, rheumatoid arthritis, type 1 diabetes, MS, etc., etc., etc. Why don’t we hear about needing to decrease the antibodies for these diseases? I do not figure that you will answer this! Ben Thank you for being here. It’s impossible for me to respond to tens of thousands of people without using pre made responses. Many of the questions are the same. I appreciate your understanding. Most autoimmune conditions have common root causes, and a lot of times the things that are recommended for one autoimmune condition will help with others. Conditions that I have found to respond really well to the Hashimoto’s protocols have been rheumatoid arthritis, lupus, Celiac disease, irritable bowel syndrome, eczema, asthma, Graves’, premature ovarian failure, psoriasis, Alopecia Areata, and Sjogrens. I have also seen the protocols help with Fibromyalgia, chronic fatigue syndrome, PCOS, as well as Type 2 diabetes, Crohn’s, and Ulcerative colitis. Thanks, Renee. I’ve requested to join your site and look forward to benefitting from the shared lessons/information of your group. I have been on LDN for about 2 months. I started at 1.5mg and moved up to 3.0mg. I started to have so much more energy and less pain on the LDN, it was like having my life back. I have since moved up to 4.5mg and I feel really great. I have started to not sleep through the night, so I might have to start taking it in the morning to see if that helps. I did have to cut back from 3 grains of Naturethroid to 2 grains because I was getting shaky hands. Cutting back worked well. Just waiting to see how it affects my antibodies. I definitely want to stay on it forever. It gives me so much energy. Robin- Thank you so much for sharing! Thyroid tissue can regenerate, but the rate at which it does is not always predictable. Thus, some are able to stop the autoimmune attack on their thyroid and regain normal thyroid function. Others can reduce the dose of medications, and others will need to stay on the medications indefinitely. I’m currently working on some protocols to help with tissue regeneration. Bernadette- Thank you so much for sharing! I look forward to hearing more of your progress on this page! Thyroid tissue can regenerate, but the rate at which it does is not always predictable. Thus, some are able to stop the autoimmune attack on their thyroid and regain normal thyroid function. Others can reduce the dose of medications, and others will need to stay on the medications indefinitely. I’m currently working on some protocols to help with tissue regeneration. Patricia- I love your positive attitude and I look forward to hearing your progress on this page! Thyroid tissue can regenerate, but the rate at which it does is not always predictable. Thus, some are able to stop the autoimmune attack on their thyroid and regain normal thyroid function. Others can reduce the dose of medications, and others will need to stay on the medications indefinitely. I’m currently working on some protocols to help with tissue regeneration. I would love for someone to please explain to me why I need to take Naltrexone, it scares me from what I originally read about it. I have hashimotos, take synthroid .125mcg and cytomel 5mcg, but my blood work for my t3 is almost in the 400 range and suppose to be in the 70’s? I’m also going to have a surgery and am wondering how long I need to be off Naltrexone before the surgery. Is there a special type of diet I should be on? Any advise on this whole issue would be great. Gina – thank you for following this page. Please, understand that due to liability issues, I am unable to answer specific medical questions. Gina – Thank you for following this page. Please, understand that due to liability issues, I am unable to answer specific medical questions, but I highly recommend that you work with a functional medicine clinician. It’s an entire medical specialty dedicated to finding and treating underlying causes and prevention of serious chronic disease rather than disease symptoms. mark comments that if you are a young person, you may be able to go into remission with the naltrexone….where does that leave us who are not young? Very discouraged…. Ruth- Thyroid tissue can regenerate, but the rate at which it does is not always predictable. Thus, some are able to stop the autoimmune attack on their thyroid and regain normal thyroid function. Others can reduce the dose of medications, and others will need to stay on the medications indefinitely. I’m currently working on some protocols to help with tissue regeneration. I have been on it for 41/2 weeks, along with T3 and T4 combo therapy and I feel terrific. My symptoms have abated. Even my arthritis has abated! Who knew that all this could happen in a matter of weeks. My previous doctors said there was nothing he could do for me… I found the right doctor now… and will stay with him until I got this licked. Bob- I am so happy to hear that! Thyroid tissue can regenerate, but the rate at which it does is not always predictable. Thus, some are able to stop the autoimmune attack on their thyroid and regain normal thyroid function. Others can reduce the dose of medications, and others will need to stay on the medications indefinitely. I’m currently working on some protocols to help with tissue regeneration. I am Hashi and I am taking LDN for 5 months now. I can’t tell that it cured me – I know I have lots more to do to heal my gut, adrenals, change diet, optimise thyroid meds (on thyroxine only now) but it stopped me from going down the hill completely. Before I would have such a terrible fatigue symptoms that I would cry if I would have any energy left after all day at work. I was going to give up everything as I couldnt imagine carrying on like this any longer. And now – it’s manageable. No problems with sleeping – quite opposite I usually sleep very well now. At the beginning I had few nights with increased heart beat but that settled quickly. I self medicate myself as I couldn’t find a doctor familiar with it in the UK. My antibodies are now around 70. If you are feeling crap – I would say you have nothing to lose. Agata- There are quite a few options for thyroid medications. In my experience, what works for one person may not work for another. If your doctor will not prescribe the medication you are looking for, ask your local pharmacist for doctors in your area who prescribe the medication you are looking to try. Have you read these articles? I am trying to find a doctor to prescribe LDN for me here in the UK but as yet have not been able to find one. Has anyone got information about UK based doctors or where to purchase to self medicate. I have Hashimotos with antibody levels of >1300. Thanks. Lourde- There are quite a few options for thyroid medications. In my experience, what works for one person may not work for another. If your doctor will not prescribe the medication you are looking for, ask your local pharmacist for doctors in your area who prescribe the medication you are looking to try. Have you read these articles? My thyroid doctor told me that LDN did not work for his thyroid patients (was willing to let me try it though – I did not). Lynn- There are quite a few options for thyroid medications. In my experience, what works for one person may not work for another. If your doctor will not prescribe the medication you are looking for, ask your local pharmacist for doctors in your area who prescribe the medication you are looking to try. Have you read these articles? Wanted to give an update on my use of LDN since I posted back in 01/14. I worked my way to 3ml and after a few weeks on that dose started to have very negative effects of a VERY agitated mood and worsening fatigue. The LDN facebook group mentioned above has been very supportive in letting me know lowering the dose back down might be helpful, so I’ll try that rather than stop it, which I was considering. That can happen Kay. Sometimes you just have to find the optimal dose for you. Keep us posted. As some who was diagnosed with hypothyroidism nearly 20 years ago and treated for it conventionally, I had high hopes for Naltrexone. But then I cam across the following article that you have to admit is well written and convincing. Sorry to put you on the line, but what’s your take on this? My other question is this: Is there a particular test for Hashimoto, or the fact that my TPA is 106 is the proof? I did notice that those diagnosed with Hashimoto have numbers that are 4 times higher and beyond. D- There are quite a few options for thyroid medications. In my experience, what works for one person may not work for another. If your doctor will not prescribe the medication you are looking for, ask your local pharmacist for doctors in your area who prescribe the medication you are looking to try. Have you read these articles? The test for Hashimoto’s are the antibody tests, Thyroid Peroxidase (TPO) and Thyroglobulin, Antibody. I’ve never heard of TPA so not sure what you are referring to. Apelila- These are the recommended labs from my book, page 32.
d…I noticed that article was written in 2010…is there anything more up to date?? Can this work for graves disease too? Natasha- Graves and Hashimoto’s are both autoimmune conditions that affect the thyroid. They are thought to be closely related. Sometimes one turns into the other. The difference is the site of the antibody attack. In Hashimoto’s, the antibodies are found to thyroglobulin (in 80%) and thyroid peroxidase (TPO) enzyme (in 95% of people)-Hashimoto’s results in hypothyroidism and is usually treated with Synthroid and replacement hormone. I have chronic fibrosing thyroiditis. I take 75 levo for it. Do you think this would help in my instance? I am gluten free. Tracy- There are quite a few options for thyroid medications. In my experience, what works for one person may not work for another. If your doctor will not prescribe the medication you are looking for, ask your local pharmacist for doctors in your area who prescribe the medication you are looking to try. Have you read these articles? Does this work for graves disease? Tammy- Graves and Hashimoto’s are both autoimmune conditions that affect the thyroid. They are thought to be closely related. Sometimes one turns into the other. The difference is the site of the antibody attack. In Hashimoto’s, the antibodies are found to thyroglobulin (in 80%) and thyroid peroxidase (TPO) enzyme (in 95% of people)-Hashimoto’s results in hypothyroidism and is usually treated with Synthroid and replacement hormone. Yes, LDN can also work for Graves disease. Because I suffer from terrible insomnia which seems exacerbated by taking LDN at bedtime (now at dose of 3.5 mg), I wanted to see if I could take it with my thyroid medication (2.5 mg compounded T3 plus 16. 25 mg NatureThroid) in the morning without affecting the thyroid medication. Arline- There are quite a few options for thyroid medications. In my experience, what works for one person may not work for another. If your doctor will not prescribe the medication you are looking for, ask your local pharmacist for doctors in your area who prescribe the medication you are looking to try. Have you read these articles? The people in the LDN groups on facebook will tell you it’s ok to take the LDN in the morning. But always best NOT to take anything with your thyroid hormone. Separate them by an hour. Apelila- There are quite a few options for thyroid medications. In my experience, what works for one person may not work for another. If your doctor will not prescribe the medication you are looking for, ask your local pharmacist for doctors in your area who prescribe the medication you are looking to try. Have you read these articles? I have hashi’s and have been taking LDN for several years, and yes, I do take it in the morning when I wake up….Not knowing any better I also take my thyroid meds at same time…..after several years of doing this I have had no ill effects with my thyroid meds, and will continue to do so….LDN is GREAT! Margaret- Thyroid tissue can regenerate, but the rate at which it does is not always predictable. Thus, some are able to stop the autoimmune attack on their thyroid and regain normal thyroid function. Others can reduce the dose of medications, and others will need to stay on the medications indefinitely. I’m currently working on some protocols to help with tissue regeneration. I have suffered with sinus polyps for the past 6 years. I was also diagnosed with Hashimotos several years before that, but after losing insurance, it was left untreated for the past 6 years as well. I also have severe allergies. From what I understand, auto-immune deficiency causes allergies, which can then causes sinus polyps. I have been working with my compounding pharmacist and am in my 2nd month of using a pro-biotic and D-Hist. I have been on steroids off and on for the past 6 years and desperately need to get off of them. I cannot taste or smell or breath out my nose if I am not taking them. Will this LDN work in my situation? I just recently had my tsh, free t3, free t4 and tpo checked and they were in perfect range. I’m at a loss!! Rhonda- There are quite a few options for thyroid medications. In my experience, what works for one person may not work for another. If your doctor will not prescribe the medication you are looking for, ask your local pharmacist for doctors in your area who prescribe the medication you are looking to try. Have you read these articles? I’ve had Hashimotos for over 10 years now plus type 1 diabetes for 18 years. I am wondering if LDN would be able to have an effect on my thyroid or is it too late? Has my thyroid already been too damaged? I take 100 mg synthroid daily and feel rather controlled. Karen- Thyroid tissue can regenerate, but the rate at which it does is not always predictable. Thus, some are able to stop the autoimmune attack on their thyroid and regain normal thyroid function. Others can reduce the dose of medications, and others will need to stay on the medications indefinitely. I’m currently working on some protocols to help with tissue regeneration. I took it 6 months. I really don’t think it did much for me. My tpos went from 720 may to 670 august. Ugghhh. Debating on going to see an endo. Thom- There are quite a few options for thyroid medications. In my experience, what works for one person may not work for another. If your doctor will not prescribe the medication you are looking for, ask your local pharmacist for doctors in your area who prescribe the medication you are looking to try. Have you read these articles? I have hashimoto hypothroidism. Was on 180 mg of erfa thyroid. Tsh was suppressed to zeros ft3 mid to upper. Ft4 mid range. Still suffered with usual hypo symptoms. Adreanals ok ferritin 56 and working on it. Big mistake because I crashed and my bloods said my TSH was 47. And ft4 was very low 8 and ft3 3.2 so where does this leave me. I figure that swapping endorphin for actual thyroid hormone is dangerous for me. The endorphins made me feel safe and well to drop the erfa but all the while I was sliding into hypothroidism. And I had to stop ldn and try move my dose of erfa back up. I couldn’t just up the erfa and take a lower dose of ldn because the slide into hypo was making me rely on bursts of adreanaline to keep me going so I am adreanal fatigued and couldn’t tolerate more thyroid too quick even though I need it. really wanted to benefit from ldn. Josephine- There are quite a few options for thyroid medications. In my experience, what works for one person may not work for another. If your doctor will not prescribe the medication you are looking for, ask your local pharmacist for doctors in your area who prescribe the medication you are looking to try. Have you read these articles? Hi, ive hashimotos hypothroidism 15 years. I know my thyroid is completey damaged and I need thyroid hormone, so if I take ldn is it safe to do this. Josephine- Thyroid tissue can regenerate, but the rate at which it does is not always predictable. Thus, some are able to stop the autoimmune attack on their thyroid and regain normal thyroid function. Others can reduce the dose of medications, and others will need to stay on the medications indefinitely. I’m currently working on some protocols to help with tissue regeneration. LDN is safe. It may or may not help you. IF you are taking thyroid medication, start the LDN very low, the suggestion is 1.5mg. If you notice any hyper symptoms lower your thyroid dose by 15-30mg . Work with a doctor to balance these medications. Apelila- People with Hashimoto’s may experience BOTH hypothyroid and hyperthyroid symptoms because as the thyroid cells are destroyed, stored hormones are released into the circulation causing a toxic level of thyroid hormone in the body, also known as thyrotoxicosis or Hashitoxicosis. Eventually, the stored thyroid may become depleted and due to thyroid cell damage, the person is no longer able to produce enough hormones. At this time, hypothyroidism develops. I’m wondering what Patricia did to improve her antibodies. Yes it is good for Graves as well. I’m now allergic to the western pharmaceutical medicine so just take bugleweed, lemon balm and motherwort extracts twice a day, have found and avoided more food sensitivities, try to heal the gut, take cordyceps powder in the morning to modulate immune system (you can take at least 1 tbsp per day), and although my antibodies are still high, I’m almost subclinical and feel fine. Also tested positive for Lyme via Igenex testing, lots of ppl with thyroid issues also have Lyme and co infections but don’t know it. Using herbs to address this, Buhner protocol, buy his book. If anyone with thyroid has subclinical Lyme, your thyroid will not resolve. The tests doctors normally run are highly inaccurate, pay out of pocket to see naturopath or functional medicine doctor, and get Igenex Lyme and co infection tests. Good luck everyone! And definitely stay totally gluten free if you have thyroid disease. May- Thyroid tissue can regenerate, but the rate at which it does is not always predictable. Thus, some are able to stop the autoimmune attack on their thyroid and regain normal thyroid function. Others can reduce the dose of medications, and others will need to stay on the medications indefinitely. I’m currently working on some protocols to help with tissue regeneration. For those of you that LDN isn’t helping, could it be because you don’t have autoimmune related hypothyroidism? I just ordered LDN and hoping it will help reduce my Anti-TPO. I am now at 6 grains/day of Thyroid and feel like there would be no end to raising my dose if LDN doesn’t help me. Kara- There are quite a few options for thyroid medications. In my experience, what works for one person may not work for another. If your doctor will not prescribe the medication you are looking for, ask your local pharmacist for doctors in your area who prescribe the medication you are looking to try. Have you read these articles? I have Hashimotos, post total thyroidectomy due to suspicious nodules that were benign. I am also a type 1 diabetic diagnosed at age 44. Would LDN affect my autoimmune diabetes? Perhaps positively by decreasing antibodies? Thank you!!! Lorraine- Most thyroid conditions result from the immune system attacking the thyroid because the immune system is out of balance. Even when the thyroid is taken out surgically, is ‘dead’, or treated with radioactive iodine the autoimmunity still persists in most cases. Many people will have their thyroids removed, and will develop new autoimmune disorders such as Lupus, Rheumatoid arthritis, etc. The immune system just finds a different target. We need to re-balance the immune system to prevent this (sometimes the autoimmunity can be reversed as well). The gut determines your immune system. With the exception of discussing proper thyroid medication dosing, the majority of my website and my book focuses on balancing the immune system. The info I present is based on my own research and journey for overcoming my autoimmune thyroid condition. As a graduate student, years ago, I recall using naltrexone for its function as an opiod receptor antagonist. This seems counter to its ability to increase opiod receptor numbers or sensitivity and therefore the effects of endorphins. Can you explain this apparent paradox to me? Is it a dosage related issue? Laura- Naltrexone is an FDA-approved medication used for opioid withdrawal at a dose of 50 mg per day. However, only low doses of 1.5–4.5 mg per day have been found to tweak the immune system and have shown promise in improving cases of autoimmune disease, including Crohn’s, MS and Hashimoto’s, as well as other immune system-related conditions such as cancer and HIV/AIDS. There are quite a few options for thyroid medications. In my experience, what works for one person may not work for another. If your doctor will not prescribe the medication you are looking for, ask your local pharmacist for doctors in your area who prescribe the medication you are looking to try. Have you read these articles? My functional physician agreed to let me try LDN and I’ve been on it since August. (He started me at 3 ml, which seems to be much higher than what is recommended here.) Contrary to what others have said, I find it helps me sleep more soundly, and I feel more relaxed. However, I did have nightmares initially, and would wake up cranky and even angry, but fortunately those symptoms have gone away. I have not noticed any changes in my Hashi’s symptoms, but hope that there will be a change over time. I’m going back to see my doctor next month and will see if he wants to make any changes at that time. Vineeta- There are quite a few options for thyroid medications. In my experience, what works for one person may not work for another. If your doctor will not prescribe the medication you are looking for, ask your local pharmacist for doctors in your area who prescribe the medication you are looking to try. Have you read these articles? I am on LDN. I was on Armour, but a new dr switched me to Levothyroxin, and discontinued the Bioidentical hormones. She said that Armour is not as effective for Hashi’s as Levo. My achey & stiff joints returned within a week and thinning hair. We are awaiting new thyroid labs that were drawn 3 days ago. What are the best thyroid meds for my Hashimotos? Debbie- There are quite a few options for thyroid medications. In my experience, what works for one person may not work for another. If your doctor will not prescribe the medication you are looking for, ask your local pharmacist for doctors in your area who prescribe the medication you are looking to try. Have you read these articles? Just wondering LDN’s effectiveness with type two diabetes? Kathy- There are quite a few options for thyroid medications. In my experience, what works for one person may not work for another. If your doctor will not prescribe the medication you are looking for, ask your local pharmacist for doctors in your area who prescribe the medication you are looking to try. Have you read these articles? I have been on 1.5 LDN for 3 months and just had my TPO tested. It was at 780 and has increased to 2911. I have noticed increased hives. My new Endo took me off Naturthroid and put me on 100 mcg synthroid. I am 45 and seems like my symptoms are not getting any better. My eating habits are not great but my naturopath took food tests are the only thing I don’t tolerate well is brewer’s /baker’s yeast. I’m debating just stopping LDN all together…Oh my ALT levels are high…Grrr frustrating! I was on Armour for 15 years and also tried all the others Levothyroxin synthyrod all of it. I became allergic to all of it. I now take Tirosint 125. I fill so much better than before. Pamela- Thyroid tissue can regenerate, but the rate at which it does is not always predictable. Thus, some are able to stop the autoimmune attack on their thyroid and regain normal thyroid function. Others can reduce the dose of medications, and others will need to stay on the medications indefinitely. I’m currently working on some protocols to help with tissue regeneration. Which Dr. prescribes this medication your family Dr. or your Endocrinologist? Eve- There are quite a few options for thyroid medications. In my experience, what works for one person may not work for another. If your doctor will not prescribe the medication you are looking for, ask your local pharmacist for doctors in your area who prescribe the medication you are looking to try. Have you read these articles? Do you have any information on how LDN may help with hypothyroidism (don’t know if Hashimotos yet) and Lupus? Liz- There are quite a few options for thyroid medications. In my experience, what works for one person may not work for another. If your doctor will not prescribe the medication you are looking for, ask your local pharmacist for doctors in your area who prescribe the medication you are looking to try. Have you read these articles? I have fibromyalgia, but I also have an Autoimmune Disorder, Mitochondrial Disease, Autoimmune Neuropathy/Peripheral Neuropathy, Autonomic Fiber Sensory Neuropathy, Ankylosing Spondylitis, Cervical Stenosis, Degenerative Joint Disease, MTHFR (Methylene Tetrahydrofolate Reductase Deficiency), Osteoarthritis, PTSD/military related, Adrenal Fatigue, Chronic Fatigue Syndrome, Orthostatic Hypotension, Depression and Social Anxiety Disorder. And no, I didn’t make up these disorders, they were initially diagnosed Molecular Neurologist, reconfirmed by a team of neurologists at Mayo in Scottsdale, and further confirmed during a week long study with a team of Molecular Neurologists at Barnes-Jewish in St. Louis, MO. nearly 10 years ago. I’ve been told countless times by various specialty physicians that the Mitochondrial Disease and other cellular-related disorders are considered Rare by NIH, have no definitive treatment, and are incurable. Doctors are initially intrigued by my disorders and tend to delve into them only to discover their actual complexity. I couldn’t begin to list the myriad of tests I’ve had along the way with some of the EMGs being excruciatingly painful. To date, my treatment plan, which isn’t noticeably effective, includes intake of prescription Carnitor from Sigma Tau 990mg 3x per day, COQ-10 200 mg per day, Magnesium, B-12 tablets, Folic Acid, Lovaza 2 capsules per day, Vit-D 50,000 units 1x per week, Turmeric, Cranberry + Vit C, Glucosamine & Chondroitin 500 mg per day, Multi-Vitamin, Acidolphilus Probiotic, Fludrocortisone Acetate 0.1 2x per day & Pseudroephedrine Hydrochloride 30 mg 1x per day & Sea Salt 1 GM 3x per day in glass of water (for Orthostatic Hypotension). I began taking Low Dose (LDN) three months ago at the 1 mg per day dose, and didn’t experience any problems but also didn’t notice symptomatic improvement. I was titrated up to 3 GM per day and used this dosage for 2 months, but the side effects (increased dizziness, fuzzy headed, irritable, sleep disturbance even when taking in the morning, and yesterday I finished titrating off this medication. I received this medication from a compounding pharmacy at a cost of nearly $50 per month. I was initially optimistic about it’s potential for helping relieve some of my daily symptoms/pain, but it eventually added to them and also exacerbated my depression to the point of having to talk with my psychiatrist multiple times per week by phone. I fully understand that my disorders are off-putting for many medical professionals due to their rarity and non-specific treatment options, but I have to live with these disorders every day and would be incredibly grateful for anyone who takes the initiative to explore these maladies and offer some potentially viable treatment options for me. At the present time I have no quality of life, merely a painful day-to-day existence. Thank You! for your interest in hearing from people with these complex disorders. Jim- I personally struggled with pain in the form of body aches and stiffness as well as carpal tunnel in both arms in 2010, when I was first diagnosed with Hashimoto’s. It was awful, I had to wear braces on both arms all day and even at night for about 6 months. Jim, I have no idea if this might help or not but have you checked out Dr. Sarah Myhill’s website? I have Hashimoto’s but kept digging to find my root cause & discovered that I have Chronic Fatigue Syndrome. Dr. Myhill has amazing info on her website, she is in the U.K. and there CFS is called M.E. Anyway, I discovered that getting CFS/ME is what caused me to eventually get Hashi’s. I also have PTSD. I am feeling much better now that I have started taking her recommended supplements for mitochondria support & methylation cycle protocol. You can also join the support group on fb where people are very happy to share their knowledge. It’s called; Support for followers of Dr. Myhill’s protocol. Best wishes! I’ll take a look at her website. It’ll be interesting to compare her supplement recommendation along with any other treatment suggestions with those recommended/prescribed by the Molecular Neurologists that initially diagnosed my condition and treated me. Hello Jim, I have been sick for 3 years with what doctors tell me is CFS/ ME, mold exposure, heavy metal toxicity, mitochondrial disease,, ehlers danlos, immune deficiency, . I suffer from General fatigue and post exertion all malaise, major food interlorances, chronic diarhhea, cognitive problems brain fog, ringing in the ears, neuropathy,vertigo, etc. I have been taking 1/5 of 0.5 mg in the morning for over 1 year. I found that for me titration up didn’t really matter I felt major benefits from an extremely low dose. It probably took me around six months to see any benefits. In the beginning I had much worsening in symptoms, I’m glad I stuck through it for this long. You might want to consider taking a really low dose that your body can tolerate and try it for at least six months. I used the lowest starting dose possible according to the compounding pharmacist. Unfortunately, that amount didn’t help alleviate the symptoms, so I slowly titrated up under the guidance of my doctor. But the higher dose caused some nasty side effects, so I backed off over a 6 week period to the lowest possible dose. I tried that for a few weeks but didn’t have any relief, so I stopped taking it altogether. With an issue of PTSD in the lineup I can’t use any medication that causes a flare-up, but that’s what happened. As low as $15/mo? Where? I haven’t found it. Started LDN December 2014. Sunny- There are quite a few options for thyroid medications. In my experience, what works for one person may not work for another. If your doctor will not prescribe the medication you are looking for, ask your local pharmacist for doctors in your area who prescribe the medication you are looking to try. Have you read these articles? Armour can also perpetuate antibodies, as it is derived from natural animal based sources. I found that my antibodies were much higher, even though I felt better. My goal is to get rid of the antibodies so I had to switch to synthetics. My naturopath said she has seen this trend in nearly all of her patients and only has one that still takes armour. Bri- There are quite a few options for thyroid medications. In my experience, what works for one person may not work for another. If your doctor will not prescribe the medication you are looking for, ask your local pharmacist for doctors in your area who prescribe the medication you are looking to try. Have you read these articles? Brain Fog ? dump the grains, especially the wheat and gluten grains. You may have to go further but I noticed a big difference with just the grains. Daughter also got rid of terrible headaches after she gave up wheat. shirley- Most people will see a dramatic reduction in gut symptoms, brain symptoms, skin breakouts and pain by eliminating the foods they are sensitive to. Some will also see a significant reduction in thyroid antibodies! An additional subset of people, will actually be able to get their Hashimoto’s into complete remission just by getting off the foods they react to, normalizing their thyroid antibodies, and some even normalizing their thyroid function! Here are a couple of articles you may find helpful. One of the major problems with a strict gluten-free diet, aside from the outrageous cost, is the addition of sugar, these products are loaded with it per my nutritionist. Also, you may be interested in checking out the Root Cause Recipe Portal. It is full of autoimmune paleo and paleo recipes. You’re able to organize weekly shopping lists, meal planning, etc. Hope you check it out. The multiple rare diseases and disorders that I’ve been disgnosed with create a very complex challenge for doctors regardless of their specialty. I’ve traveled multiple times to Mayo and come away with the same result–they confirm former diagnoses but have nothing definitive to offer with regard to actual an treatment. The same occurrence a several well recognized medical facilities (i.e., Barnes-Jewish/St. Louis Medical School). Everything about my treatment has been trial-and-error, primarily the latter. Several doctors have been blatantly honest with me and said they just don’t know what to do since the bulk of their education and experience has involved mainstream treatment options that have been definitively tested. When a rare disorder is confronting them they are no medical trials underway because there’s no $$ available because there are so few people affected by that particular issue. In other words, the medical treatment arrangement is not designed or comfortable having to deal with rare diseases and disorders because it isn’t cost effective. The bottom line, it’s all about the the $$. Go gluten free. I was taking 360 mg of armour per day but have dropped to 120 mg per day. In the two years since I went low carb and gluten free I have gone from busting out of size 14 to a 6. Cregan- Most people will see a dramatic reduction in gut symptoms, brain symptoms, skin breakouts and pain by eliminating the foods they are sensitive to. Some will also see a significant reduction in thyroid antibodies! An additional subset of people, will actually be able to get their Hashimoto’s into complete remission just by getting off the foods they react to, normalizing their thyroid antibodies, and some even normalizing their thyroid function! Here are a couple of articles you may find helpful. Lori- That is amazing! Thank you so much for sharing! You may be interested in checking out the Root Cause Recipe Portal. It is full of autoimmune paleo and paleo recipes. You’re able to organize weekly shopping lists, meal planning, etc. Hope you check it out. My question exactly! Im up to 4.5mg LDN at night to help with gut motility/IBS. Not noticing any effect so far. Also taking T4/T3 since thyroid removal 3 yrs ago. Niz- Not everyone will need every single supplement! In fact, I believe that most nutrients should come from the diet, this is why I always list food sources for most of the nutrients, vitamins, minerals and probiotics that are depleted in Hashimoto’s in the book and on the blog. However, some may require/prefer supplements and the supplements on the website are a resource for those that do. I recommend getting tested for deficiencies to determine your need for a supplement as instructed in the book and blog. I also don’t recommend starting multiple supplements all at once. I recommend starting one at a time and then adding another a week or so later once it has been confirmed that the first supplement is not causing any harm. I was diagnosed with Hashimotos years ago!!!! Searched and searched for doctor to diagnose me. I knew I was depressed and tired for no reason!!!!! Finally an Endocrinology doctor (who has horrible bedside manner) ran antibody test…BOOM, hashimotos. Other docs just ran standard T4 and tsh test and was a little low. Wanted me to wait couple months, however, in meantime I was dying inside I felt. Kept reaching out and was finally diagnosed properly. Been on synthroid since…the point is they have to test antibodies!!!!!! I have had a lot of luck with WP Thyroid. I have a ton of allergies, but the WP has caused no side effects or adverse reactions and all my thyroid labs are now in good to optimal ranges. Arika- Thyroid tissue can regenerate, but the rate at which it does is not always predictable. Thus, some are able to stop the autoimmune attack on their thyroid and regain normal thyroid function. Others can reduce the dose of medications, and others will need to stay on the medications indefinitely. I’m currently working on some protocols to help with tissue regeneration. Jim, was it the generic form? Generic I just as effective as brand/trade. I have been taking low dose of valtrex for almost 2 years for my hashimotos, and went to have my thyroid levels tested last week, and they are no longer hypo, but in normal range….this valtrex is the only change I have made, so it has to be the thing that healed it. Yay! Thank you dr Hankins! Stevi- Thyroid tissue can regenerate, but the rate at which it does is not always predictable. Thus, some are able to stop the autoimmune attack on their thyroid and regain normal thyroid function. Others can reduce the dose of medications, and others will need to stay on the medications indefinitely. I’m currently working on some protocols to help with tissue regeneration. I have arthritis for past 6 months, I take LDN, the inflamation in the body is gone, but joints, bones and nodules are still growing all over my body and LDN doesn’t stop it. I would like to ask you, if you know, LDN does influence lab tests, or you have to get off the LDN for some time, before you go to lab testing? And I am looking for a functional medicine doctor. Can you help? Would very apprecciate:) Thank you! Vita – please, understand that due to liability issues, I am unable to answer specific medical questions. I have had a hashimotos diaginosis for 11 years. I’m in level 7 pain daily particularly with the fatigue, brain fog, weight gain (sometimes 7lbs overnight), chin hair, acne, tinnitus and neck/ear/joint/back pain. I feel that I have to exert extraordinary energy just to keep my head up. I finally got a new endocrinologist who wasn’t very nice. He added cytomel which ironically has intensified the neck issue. I ordered your book on audible in hopes that I can get relief because I’m at a point where I am losing hope. I’m only 34 and I feel like I’m dying a slow death. MY question is no one wants to prescribe ldn and I’m at a point where I would try anything. Do you have guidance on this? I have no been allergy tested or done a full elimination diet. I’ve cut meat, dairy and eggs out and am still gaining weight. I hate this disease. I’ve tried two courses of LDN – but could only tolerate (barely) for two weeks. The symptoms were that of being comatose. I just felt dead to the world and completely out of it. Catherine – thank you for following this page. I’ve been taking LDN AT 1.5 mg for 1 night and 3 days. I went to days because I didn’t sleep the 1st night, and as everyone knows sleep is imperative to healing. I switched it to days and I have horrible gut pain and nausea. I get a really bad headache midday. I don’t have a weight issue as I’m already super skinny. If I keep taking it and feel this way, I’ll lose more weight because I feel so sick. Is it worth it? Renata – thank you for following this page. Please, understand that due to liability issues, I am unable to answer specific medical questions. After reading about LDN I am wondering if you might tell me about potential contraindications when taking metforminER; is this medication safe for those trying to get pg or BE pg? Are there any studies showing potential dangers of being on LDN during pg? I have been tested for hashimotos and antibodies and they’ve been negative, but I have been reading/trying to determine if there is something I could take to aid immune issues re; getting pg (potential immune rejection w/ 3 early miscarriages, difficulty getting pg despite repeat efforts/years and few if any Repro Endocrinologists in the country aware or interested in determining if I have immune issues in this area – I’ve been diagnosed with “idiopathic infertility”). Can you give me any more guidance or information re: LDN for this purpose? I struggle with fibro, hypo-thyroid (balanced with armour with low TSH on meds), and migraines. Thank you, please if you can help me at all!! Wynonah – thank you for following this page. Please, understand that due to liability issues, I am unable to answer specific medical questions. I am 55. I was dx’d at 31 with hashimoto disease, and my Dr had me on synthetic treatments, which I took until 2010 (18 years), I moved to a new city, no job, no insurance, and no way to get meds. I stopped cold turkey, which was possibly the worst thing I could have done, because I was also dealing with the quick and unexpected loss of my mother and all the family drama that goes with that. I finally, after 6 months found a naturopathic dr, who got me onto armour along with acupuncture. I started to come back alive, but barely. Really wish you were around then. I love your book and incorporate many of your theories, problem is along the way (lost my father and my husband, and I was destitute but proud), I also picked up the lovely shingles virus. Not on my torso, but on the back of my thighs, and for 2 years have experienced painful and large break outs every 6 weeks or so. I read/digest many things and think that I have both epstein barr and hashimoto. Its a super hard diet to follow, I take 6000-10000 units of lysine daily to counter act the arginine in many foods. INHALE…. my new naturopathic Dr has given me the LDN for a 3 month trial. While I have broken out in shingles (a lot of stress in my job as I am OCD- and very competitive) I have gone 4 weeks with no painful outbreaks, until 3 days ago, and the small blister that came about was manageable (I take nothing for the pain, not even aspirin/tylenol/ibuprofen) so maybe this LDN will work for me, I am hopeful, as this will be a BIG game changer. I just had blood tests done for thyroid, and for adrenals, even though I feel like my levels are low, I am hopeful that my other indicators are vanishing. I was very hesitant with the LDN, as I try to eat clean and take no more meds other than armour 2 grains. In order to self-advocate, it’s important to understand the ins and outs of thyroid medications. There are many reasons why your thyroid levels might not be optimal and my Optimizing Thyroid Medications eBook will give you those answers as well as give you a full explanation of the different options that are available to you! I want you to be empowered, so I’m giving this eBook away as a FREE download this week! Download it for FREE Optimizing Thyroid Medications eBook! Would I be a candidate for LDN? I was diagnosed with Hashimoto’s several years ago after suffering frequent and at first debilitating rapid heart rate. I was on a low dose of Metoprolol which reduced the severity of each attack. Eventually I improved to where I stopped all medication. Currently, I have an attack about once a month sometimes mild but like last night, very severe with my heart going so fast and hard it was like someone was clapping their hands. I have found that drinking a glass of water before bed and not eating too late helps. Do you have any suggestions for me? Tony – thank you for following this page. Please, understand that due to liability issues, I am unable to answer specific medical questions. I would like to have some online consultations with you. I live in Europe. Is this possible? I have a lot of questions regarding my newly diagnosed Hashimoto disease. I wanted to ask: how much Thiamine is safe per day? I do not have the recources to do a blood test…. I purchased Thiamine 100mg per capsule. Is this oke or too much? It is mainly for restoring the stomache acid and the low blood pressure that occurs sometimes. Sara – thank you for following this page. For questions pertaining to the supplements please contact my team at info@thyroidpharmacist.com and they will be happy to help you. I have a question regarding the use of Vitamin B1 Thiamine. I just started taking 1 capsule per day of 100mg per capsule. I read in the book Hashimoto;s Protocol that Vit. B1 can help with low blood pressure and with low stomach acid. I experience low blood pressure when I feel ‘full’ in my stomach. I really think that because of the low stomach acid, the stomach gets upset and kind of bounces to the heart, which cause an imbalance in my blood pressure. Could this be true? And: should I use only vit. B1 or also start using Betaine HCL? Maybe this will fasten the process of digestion and this way I won’t experience low blood pressure anymore. How safe is Vit. B1 and will it cause any deficiencies in other Vitamine B’s? Naltrexone can be a maybe wonder drug…but in my case, 4.5 mg of naltrexone over 18 months, went from peroxidase 839 to 100…thyroglobulin 128 to 4..and then it just quit working over the next year and everything went back up! Now have stopped taking it. I have been tested for just about everything, went on AIP diet for 4 months, and still can’t get rid of the acne flair ups. Really don’t feel much different by adding back in some foods to test, Armour 45mg…my TSH/T3/T4 etc are good numbers, good sleep, good energy etc…probably do have leaky gut, trying so hard to stop the Acne?? Added in Zinc/Selenium and digestive enzymes etc., read Hashimotos Protocol and lots of other articles…. what’s a girl to do?? Judy – Thank you for following this page. Did you know that reactive foods trigger an inflammatory response in the GI tract, leading to malabsorption of nutrients (gluten sensitivity in particular has been implicated in causing a Selenium deficiency, a well known risk factor for Hashimoto’s), and can also produce intestinal permeability whenever they are eaten? My doctor second doctor diagnose was Hashimoto, my first doctor who had me on thyroid medication, didn’t even see it. I was taking Synthroid 25 and second doctor put me on Synthroid 50. I read my last blood test and my T3/T4 were off the chart. So until I can see my doctor again I stop my medication. In March before the test T3/T4 were normal. I had a test for my thyroid and have three nodule the doctor said we wait and see. I don’t have cancer so no surgery is necessary. I was taking vitamins for your thyroid so I don’t if that hurt with the medication. Sandra – thank you for following this page. When you are prescribed thyroid replacement hormone but your thyroid levels are still not optimal and your doctor is convinced that Synthroid® (which is a T4 only hormone replacement) is the only replacement that you should try, remember, information is power! In order to self-advocate, it’s important to understand the ins and outs of thyroid medications. There are many reasons why your thyroid levels might not be optimal and my Optimizing Thyroid Medications eBook will give you those answers as well as give you a full explanation of the different options that are available to you! I want you to be empowered, so I’m giving this eBook away as a FREE download this week! Download it for FREE Optimizing Thyroid Medications eBook! BTW I was recommended Inosine by a (non-Hashimoto) friend who said it helped him to reduce his chronical fatigue (as I understand it must be taken in interwall doses). Do you by any chance have any experience with Hashimoto and Inosine? Is there any reason why a Hashimoto patient should not try it? And are there other remedies that it should not be combined with? Or that it should be combined with? It is said in the info I have managed to find that It helps your body make “uric acid” so I winder do people with Hashimoto’s generally have high or low levels of uric acid? As I understand too low levels are problematic because uric acid is a scavenger and hunts down bad “peroxynitrates” (and thus reduces inflammation) while too high levels can give you gout. Would you think it worth a try for a person with Hashimoto’s and fatigue and brain fog or would you say low dose naltrexone is better/safer? Ingrid – thank you for following this page. I regret that I do not have the time to evaluate every supplement on the market. It is my sincere hope, if you suffer from fatigue, hair loss, brain fog, weight management, dry skin, depression, muscle aches, and the countless other symptoms, that your life will be changed for the better after implementing the research I’ve uncovered. It can help you do what most doctors and most clinicians would consider impossible, to put Hashimoto’s into remission. LDN didn’t work for me. It made my hypo. My TG antibodies didn’t go down – they skyrocketed to record highs for me. I was on it for 10 months – did not get pregnant once. Shauna – thank you for following this page. LDN was one of the first interventions that I tried on my thyroid journey back in 2009. As a pharmacist, I was looking for the magic immune system pill, but I found that it made me somewhat irritable after a few nights of taking it, so I gave up on it and moved on to something else. Instead of working with a compounding pharmacist, I made the mistake of getting full strength naltrexone and compounding it myself. As I mentioned in Root Cause, I also used LDN before I started working on my diet. Had I worked with a knowledgeable professional, I would have learned that LDN works best when used alongside a leaky gut diet. Additionally, according to Shannon Garrett, RN- LDN may not work if someone has a candida overgrowth. In addition, for improved tolerability, titrating the dose is necessary. Here are a couple articles you might find helpful. I tried LDN and had an absolutely hideous experience. My feet and calves went into extreme spasm with my big toe pulling up toward my shin. The tissue around the muscles and Tibia became extremely withdrawn exemplifying the spasm in the calf muscle. All the willpower in the world could not bring my toe down to a normal position. It scared the living day light out of me! I felt like I was becoming crippled! It was also extremely painful throughout my legs –my right side being worse than my left. This happened in the middle of the night after takin LDN for a week. In previous days I had had some mild cramping in my legs. I had requested the medication from my Dr (and he obliged). I was thinking I had finally found something to obliterate my pain- like I had read about. I have fibromyalgia and can’t convert T4 to T3. Just thought you should hear about other experiences with LDN. I love the awesome work you are doing! K Leslie – thank you for following this page and for sharing your experience. My heart goes out to you! While I only work with patients with Hashimoto’s, oftentimes patients will have additional autoimmune conditions. Most autoimmune conditions have common root causes, and a lot of times the things that are recommended for one autoimmune condition will help with others. Conditions that I have found to respond really well to the Hashimoto’s protocols have been rheumatoid arthritis, lupus, Celiac disease, irritable bowel syndrome, eczema, asthma, Graves’, premature ovarian failure, psoriasis, Alopecia Areata, and Sjogrens. I have also seen the protocols help with Fibromyalgia, chronic fatigue syndrome, PCOS, as well as Type 2 diabetes, Crohn’s, and Ulcerative colitis. I tried LDN and couldn’t get past the 1st week because I felt sooooo sick to my stomach. I feel somewhat like that every day but this exasperated it. Any thoughts or ideas to help me in other ways to get my numbers down. Renata – thank you for following this page. Sleep disturbances nausea and irritability are some of the issues that people report. When I tried LDN at 5 mgs I got headaches, severe enough to stop. I talked with others who had the same symptom. I like the idea of liquid LDN and had not heard of it before. I hope the excipients are healthy. I would probably start with .5 mgs and build up slowly. I am a poor detoxifier with methylation, sulfation and glucoronidation challenges. Jude – thank you for following this page. It’s best to work with a compounding pharmacy that can help you titrate your dose correctly. LDN is not a commonly prescribed medication, and it may not always be possible to convince your doctor to prescribe it. On my quest to try LDN, I talked to my local compounding pharmacist to figure out which doctors in my area were knowledgeable about prescribing LDN. I also want to stress that LDN is not a cure, but rather an immune modulator that can be used to prevent further damage to the thyroid while one is looking for their root cause or to rebalance the immune system when the root cause cannot be found. Root causes are different for different people but may include infections or food sensitivities that result in an immune imbalance. Here are a couple articles you might find interesting. My doctor didn’t want to prescribe it so I tried ldndoctor.com. Appointment was online, Dr. Handler is amazing! I believe the consultation is $210.00 but you can double check on their website. From my personal experience it’s the best thing that has happened to me in a long time. Finally feeling like a normal human being again. I began taking 1 mg of LDN about 2 months ago with the inclusion of 12 mcg of Tirosint. Just received my test results and both my TSH and TPO markers went up significantly. TSH from 5.6 to 8.9 and TPO from 260 to over 1,000. Would you recommend me stopping LDN? I’m scared because I never has such elevated antibodies. In addition, would you happen to know how fast antibodies shift from low to high and vise versa? Does it take months to see significant changes or does it fluctuate more frequently? Thank you so much for all the wonderful work that you do Dr. Izabella! Anastasia – thank you for following this page. The time to start feeling better will of course vary per person. Once you start to feel better, maintain the dose for 2-3 months and follow-up with your physician to see if your laboratory markers have improved. LDN should be used as part of an arsenal to help you overcome your autoimmune condition. Appropriate levels of Vitamin D, full spectrum light exposure, food sensitivities all play a role in autoimmunity and need to be considered as well. It’s also best to work with a compounding pharmacy that can help you titrate your dose correctly. LDN is not a commonly prescribed medication, and it may not always be possible to convince your doctor to prescribe it. On my quest to try LDN, I talked to my local compounding pharmacist to figure out which doctors in my area were knowledgeable about prescribing LDN. I also want to stress that LDN is not a cure, but rather an immune modulator that can be used to prevent further damage to the thyroid while one is looking for their root cause or to rebalance the immune system when the root cause cannot be found. Root causes are different for different people but may include infections or food sensitivities that result in an immune imbalance. Here are a couple articles you might find interesting. My doctor is recommending Contrave after I messaged her about possibly getting on LDN for the hashis. Can you speak to the benefits of that over straight LDN? I cannot find information on if LDN is beneficial for those that had hashimotos and had the thyroid removed. It seems it would help deal with other autoimmune diseases that could crop up, but can you point me to any articles or research on this specifically? LDN being beneficial to those without a thyroid that had hashimotos (thyroglobulin currently undetected). Thank you. Laurie – thank you for reaching out. I would advise you to ask a compounding pharmacist or a trusted clinician who’s care you are under. Most thyroid conditions result from the immune system attacking the thyroid because the immune system is out of balance. Even when the thyroid is taken out surgically or treated with radioactive iodine the autoimmunity still persists in most cases. Many people will have their thyroids removed, and will develop new autoimmune disorders such as Lupus, Rheumatoid arthritis, etc. The immune system just finds a different target. Low Dose Naltrexone (LDN) is an immune modulator that can be used to prevent further damage to the thyroid while one is looking for their root cause or to rebalance the immune system when the root cause cannot be found. Root causes are different for different people but may include infections or food sensitivities that result in an immune imbalance. Appropriate levels of Vitamin D, full spectrum light exposure, food sensitivities all play a role in autoimmunity and need to be considered as well. It’s also best to work with a compounding pharmacy that can help you titrate your dose correctly. Hey there, I’m 17 weeks pregnant (1st pregnancy). I was able to manage my Hashi’s w AIP for a while until I got pregnant. At about 6 weeks my TSH was high and Dr put me on Tirosint (25mg). I switched to a functional medicine Dr. who retested my labs and they were still high so she upped my dose to (25mg and 13mg Tirosint). My recent labs shows RT3 of 33 which I understand is high and points to poor T3 conversion. My FMD is treating/ monitoring my thyroid as I don’t think my OB is a well versed with thyroid disease. Anyway, FMD chose to not put me on any desiccated meds because my OB isn’t a fan of them during pregnancy which is unfortunate because I’ve read a lot of women have had success during pregnancy. She did put me on 200mcg of Selenium to help w high RT3. My FT4 is 1.3 (range 0.8-1.8). FT3 2.4 (range 2.4-4.2) TPO 1 . My TSH is 2.22 and like I said RT3 is 33. She hasn’t done any iron levels but HGB and HCT and I am slightly anemic. She has me on an iron supplement but I was wondering if in your professional opinion there is anything else I can bring to her attention at my next appt? Are there any suggestions you would share I could discuss with her? Is LDN something that I could bring up to her and in what capacity? If not LDN what? I know this is a lot of questions, I just want to make sure I know what to ask and take any precautions to have the healthiest pregnancy possible and keep healthy. Thank you in advance for any suggestions! Hi we don’t get this brand Pure supplements in Singapore any alternatives ???? Thank you for the information on LDN treatment for Hashimoto’s. My wife had her thyroid removed 4 years ago due to an excessive amount of large nodules that were restricting her breathing. She has been diagnosed with Hashimoto’s, along with Type 2 Diabetes and an additional undiagnosed autoimmune marker has been located. We are with a fantastic doctor, Dr Angela DeRosa, here in Scottsdale that has done a great job with helping us with managing my wife’s disease after having a former endocrinologist almost kill her due to that doctor’s stubborn attitude. I will be speaking with Derosa’s office today about the LDN options, but would like to get some additional perspective on if LDN would be helpful for her, and what we might expect with her medication dosages with LDN, considering she no longer has her thyroid. This has been a long few years of trying to get her symptoms managed. Along the way we have discovered that we can manage some symptoms via diet, light exercise, and some supplements. We’ve also found out a number of other pieces of information that are not commonly discussed or found when doing thyroid research. As of right now, her symptoms swing to extreme levels very easily and quickly, even though her blood levels are staying in a fairly close range. These symptoms aren’t always manifested anymore based on which end of the range her levels are at either. I would love it in LDN would work for her to help bring some level of stability to her symptoms, and finally allow her a quality of life she has missed out on ever since the thyroidectomy and RAI treatment. Ken – thank you for reaching out and sharing your wife’s journey. Low Dose Naltrexone (LDN) is an immune modulator that can be used to prevent further damage to the thyroid while one is looking for their root cause or to rebalance the immune system when the root cause cannot be found. Root causes are different for different people but may include infections or food sensitivities that result in an immune imbalance. Appropriate levels of Vitamin D, full spectrum light exposure, food sensitivities all play a role in autoimmunity and need to be considered as well. It’s also best to work with a compounding pharmacy that can help you titrate your dose correctly. I have been taking LDN for two weeks. My Hashimoto’s has been severely limiting my life for about 8 years in the form of physical health, mental health, appearance, and impact to my career due to low mental cognition, memory and positive leadership and focus. For the last 6 years I have seen myself become someone I don’t know. I have been on a strict API diet for over a year and have only seen benefits to my allergic reactions, but not to my Hashimoto’s symptoms. I started taking LDN a week ago. This weekend, I was able to not only work out, but I worked out two days in a row! Today, instead of feeling like I was hit by a truck after a workout, I am full of energy. My mood is better, and I am able to focus and plan my work day (and do it with a smile on my face!). I don’t feel bloated, and my eyes, face and hands have lost their puffy appearance. I am generally feeling a little less overall pain in the joints of my knees and feet. My stomach feels “calm”. I am very hopeful LDN therapy will positively affect my high TPO count. I am feeling very positive that I am going to get my life back by taking LDN along with continuing my API diet restrictions along with the Hashimoto’s diet protocol recommended by Dr. Wentz. Tamara – thank you so much for sharing your journey with me! I am so happy to hear you are feeling so much better. Now that you have started to feeling better, maintain the dose for 2-3 months and follow-up with your physician to see if your laboratory markers have improved. LDN should be used as part of an arsenal to help you overcome your autoimmune condition. Appropriate levels of Vitamin D, full spectrum light exposure, food sensitivities all play a role in autoimmunity and need to be considered as well. It’s also best to work with a compounding pharmacy that can help you titrate your dose correctly. LDN is not a commonly prescribed medication, and it may not always be possible to convince your doctor to prescribe it. On my quest to try LDN, I talked to my local compounding pharmacist to figure out which doctors in my area were knowledgeable about prescribing LDN. I also want to stress that LDN is not a cure, but rather an immune modulator that can be used to prevent further damage to the thyroid while one is looking for their root cause or to rebalance the immune system when the root cause cannot be found. Root causes are different for different people but may include infections or food sensitivities that result in an immune imbalance. I hope you will keep me posted on your continued progress. <3 Here are a couple articles you might find interesting.